X_STUDY is a separate application which must be started the first time that you want to use it. Display the Window menu on the X_TRADER Control Panel. Select X_STUDY and then Start X_STUDY. This starts X_STUDY and enables the X_STUDY Chart icon on the X_TRADER Control Panel. Note: Access to X_STUDY is controlled by TTUS, if this option is disabled please contact your TTUS administrator. 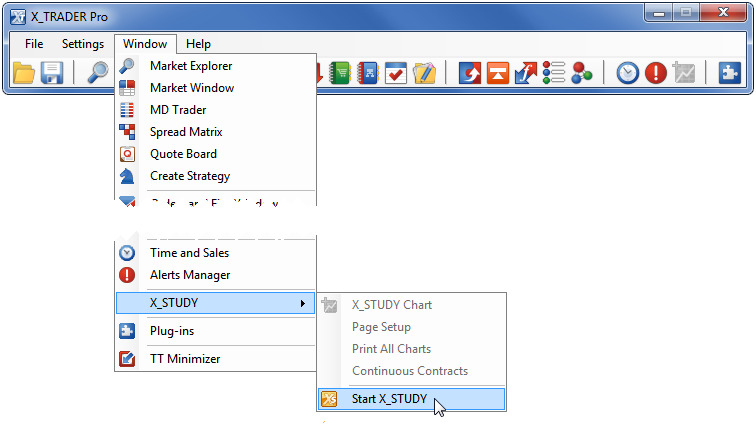 After you start X_STUDY, the X_STUDY icon will automatically enable on the X_TRADER Control Panel each time that you log into X_TRADER if you are connected to a Financial Market Data Server. The Financial Data Market Server (FMDS) provides X_STUDY with accurate historical data for prices and traded volume, along with up-to-date calendar schedules for session times and holidays. In order to run, X_STUDY requires access to an FMDS; this access is configured in TT User Setup. Contact your TT Administrator if you are unable to connect to FMDS.